On most nights, our three year old wakes up around 2 a.m. and won’t go back to sleep until we bring her into bed with us. I’m also the only one who’s allowed to put her to bed, which usually involves a nightly story (or two, or three) and a song. It’s a 30 minute process that I wish I could trim to about five minutes, but I know I’ll miss it dearly when she’s all grown up. I’ve recently discovered two products designed to help her fall asleep faster AND stay in bed if she wakes up in the middle of the night (or, worse, at 6 a.m. on a Saturday). Both are made by Onaroo by American Innovative. 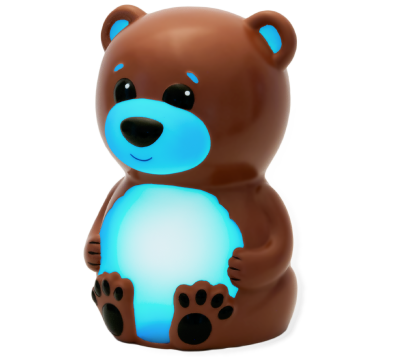 The first cool gadget is the Bowen Bear Portable Night Light. This cute little guy stands about five inches tall with a belly, face and ears that light up to cast a soothing glow to help calm our little one when she’s falling asleep. It has five night light colors which change with the push of a button and a setting that randomly switches between various colors. The second Onaroo sleepy time gadget is the Teach Me Time Talking Alarm Clock. 1. Nightlight – It glows softly to help kids fall asleep. 2. Learning tool – An interactive, talking time-teaching game has adjustable skill levels and teaches time-telling concepts on the analog and digital clock faces. 3. 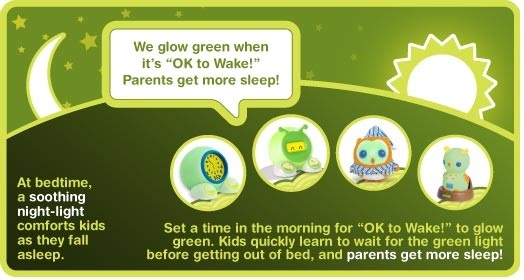 “Okay to wake” Alarm clock – At a time set by the parent, the clock will glow green, which tells your little one that it’s okay to get out of bed. In other words, parents get more sleep! Our little one loves both gadgets. Although she’s still getting the hang of the “Okay to wake” feature on the alarm clock, it has worked a few times to remind her that it’s not quite time to get out of bed. Check out Onaroo to find more fun sleep products!